Subscribe to comments with RSS or TrackBack to 'The Parthenon, 734 Harden Street: 2006'. Are they still open in Lexington? Hmm, I don't recall hearing anything about a Lexington location. I was there on the last day (I may have been the last person served..) and spoke to the staff. They were collecting an email list to let us know if they opened another restaurant (nothing came of that apparently), and I think they would have mentioned a Lexington operation.. Here is the information. I don't get out to Lexington much, but I think they're still open. I believe that it has been turned into the bar "Parrotheads"
I think that's right; If you click on the photo, you can read the name. I used to live in the second-floor apartment whose windows are to the left in the photo above. It was the first place my spouse and I lived in together. I'm glad that we got out before ParrotHeads moved in! Nice to see that they added an awning over the apartment entrance. We used to pop out of there and scare the hell out of pedestrians. Yeah, I always wondered what was going up upstairs there. You must have seen some interesting things out your windows.. I really loved The Parthenon. I had lived out of state for a number of years and was upset to find it closed last year when I moved back. I also missed Franks Hot Dogs, the corner of Harden and Greene St. The Parthenon on Harden Street was operated by Tony and Gus and their respective families. The Parthenon of Lexington is run by Tony and his family. It has been there since 1995 and they've welcomed many 5 points patrons that miss Parthenon food. I went to the Lexington location a few times after the Five Points location closed, since I live in the Northeast I don't get to Lexington to often. I must say the food was ok at best. The pizza wasn't near as good as in Five Points, the menu is much more expensive, and it is a different atmosphere than what I like. I beleive that the Parthenon folks are the owners of Zorba's Express in the Publix shopping center at the corner of Broad River & Kennerly Roads. Great food. Mr. Gus operates the Zorba's Express on Broad River Road. It is in the Publix shopping center. I went there for lunch two years ago and ordered pizza, not knowing. I almost cried at the first bite, then looked up to see a picture of the Parthenon on the wall and Mr Gus coming towards me to speak. 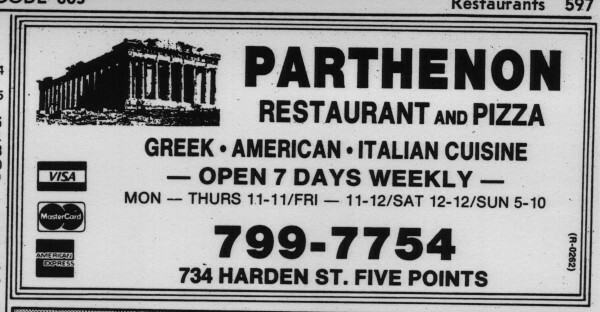 The Parthenon I remember from the 1980s had an excellent gyro as well. Good place to take a first date, unless you wanted a second date. I absolutely loved their salads and their pizza was to die for. My family took me there the weekend before I left for boot camp in 1987 and I have loved it ever since. Sure wish they hadn't left. I think all the Harden Street work was killing their business there. Hahaha, I have to laugh about the "...unless you wanted a second date" bit. I know once a mouse ran out of the kitchen, saw the woman I was dating at the time, and ran back in (for safety perhaps?) She freaked out. Unfortunately, we continued dating for some time after that... I don't believe that was the only time I saw wildlife there, but it was still worth it for the pizza. My best friend's parents regularly ordered take-out from there, so I got a good sampling of their delicious pizzas. I owned a business in Five Points back in the early eighties and ate at the Parthenon Regularly. I thought the pizza was great. The people that worked there or owned it recognized me when I went in but I don't think we ever got on a first name basis. One thing I remember is, and I believe it was the, or one of the owners that told me this. They wanted to have their name "Parthenon" painted on the side of their building closest to Yesterdays Restaurant in large letters. The Chinese Restaurant next door owned the parking lot that went right up next to the Parthenons building, and they would not allow the Parthenon to put a boom truck on their property in order to get high enough to paint the sign. It was because this might take away business from the Chinese Restaurant. So The owners of the Parthenon hired a painter that lowered himself down the side of the building from the roof to paint the sign without setting foot on the Chinese restaurant parking lot. I remember seeing this and the Chinese were not to happy. Rick, that is a great story that does not surprise me at all. I have to ask, but I guess you don't have to answer. Are you the Rick from Papa Jazz? Jonathan, no thats not me. I owned a Car Stereo Shop called Auto Sound Lab at the corner of Harden and Devine. It was in an old gas station at the time. I moved from there to the corner of Beltline and Two Notch in 1983 after Continental Sound moved out, and into their new building, across from Columbia Mall that looked like a stereo on the front. 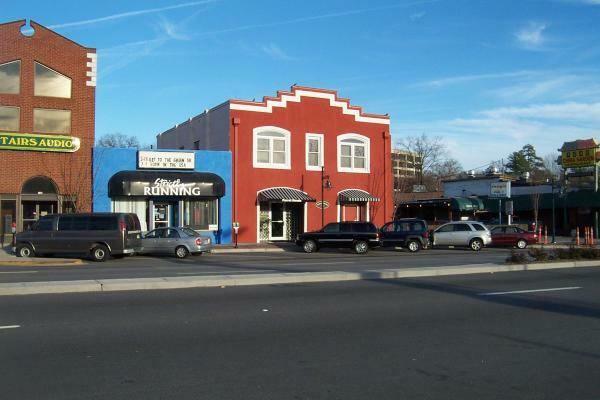 The old gas station in 5 points was torn down and Harpers Restaurant was built. But thanks for asking. Ok. Thanks for answering!!! That would have bugged me for some time! I remember your store. My buddies and I ay USC used to eat there all the time back in the 80’s. Pepperoni and mushroom pie and split a big Greek salad with feta. I believe that to be the first tomw this small town boy has ever had feta and was hooked. They are for sure missed at five points.